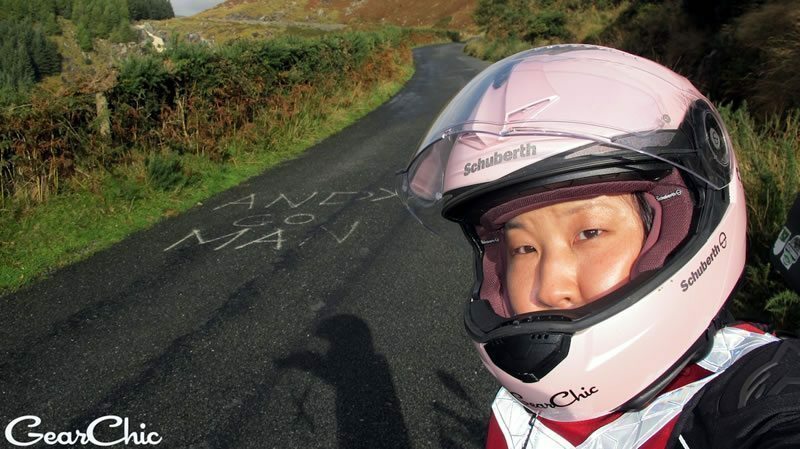 Announcing our featured Woman Motorcyclist of the Month …GearChic! Gearchic gained my respect for her passion of motorcycling. When you take one look at the past few years of this woman’s life you’ll see a love for a motorcycling that goes well beyond passion for a hobby. To Joanne “GearChic” Donn, motorcycling is a way of life. She’s a motorcyclist who has spent years working in the motorcycle industry. 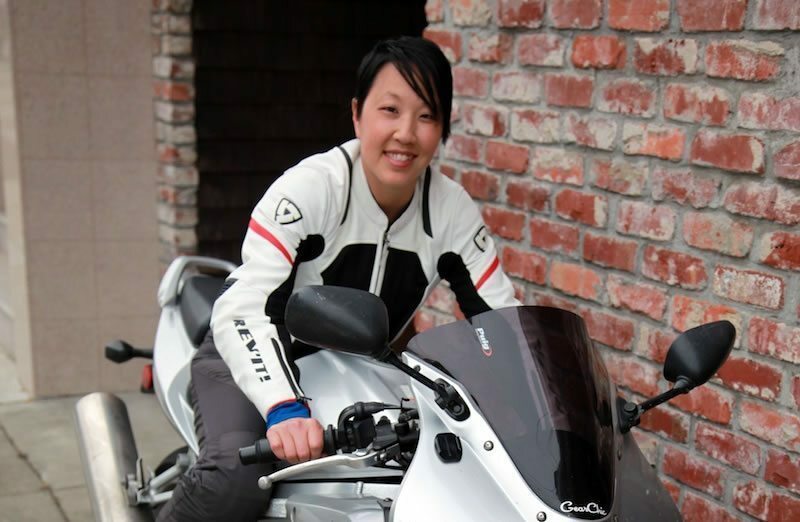 She runs her own motorcycle website, GearChic, dedicated to women’s motorcycle gear. Lastly, she’s the co-host of a podcast called Moterrific which really gives you a taste of GearChic’s depth of knowledge, familiarity and enthusiasm for all things two-wheeled. Joanne’s about to move to Philadelphia to start work at the Revzilla Headquarters Showroom, but she took a moment to give us a little peak into a truly two-wheel life. GearChic.com and learning to ride! Make your own decisions about when/what/how you ride. Never let anyone choose a motorcycle for you! YM: Hey Joanne, could you explain to the readers who you are and what you do? JD: I started GearChic.com as a way to find women’s gear, with a short directory A-Z of manufacturers making real protective women’s gear. As it evolved, I decided to turn the focus towards how to shop for gear including gear reviews and what to look for when shopping. gear that fits, And finding any gear to try on. YM: You got started on a 50cc scooter (same here! ), what motivated you to get into riding? YM: In hindsight was starting on a scooter the right choice for you? JD: Yes. I never would’ve had the confidence I gained from 1 year of scooter riding to be bold enough to ride our first motorcycle. It was a lot easier to get used to and I felt far more comfortable in the beginning than many people who make the jump directly to a motorcycle. YM: You’ve beeing doing a great job offering your gear savvy to female motorcyclists for years now. How far has the industry come? How much further do we have to go? Where have you seen the most impressive changes? JD: The industry has definitely had ups and downs. Overall I think it’s getting better and growing again after the recession in 2009, but we still have a ways to go to catch up to the motorcycle buying levels we had back then. That has greatly impacted the choices that women riders have, but there is also an important disconnect/gap that needs to be addressed as well, Dealers. When dealers don’t stock product, then women have no idea what’s available to them. There could be a dozen choices but it’s impossible to find dealers to stock even 2-3 of them. Somehow we have to get manufacturers to encourage dealers to stock more product and Dealers must find a way to improve communication with its female customer base so they can sell product and get it to the women riders who need it. Still, there’s a lot of growing to do and we need to encourage more women to ride to increase our numbers. YM: Couldn’t agree more. Let’s talk about you specifically, what has been your favorite ride so far? JD: Probably the 2 trips I’ve taken to the Lost Coast, on the northern coast of California. Each time I’ve ridden the best roads, gone the furthest on my bike and learned the most. Lots of technical, challenging roads that pushed me the furthest as a rider. YM: Who are you riding with and what are you riding these days? YM: You’re in an envious position of having a partner who rides. A lot of motorcyclists wish they had that option. How much riding really is done with your husband? JD: Sadly not as much as I ‘d like. I’m more into riding than he is and just happen to have a larger network of friends to go riding with. He’s also our breadwinner so he’s been working really hard this year so we can have a better life. For that I’m extremely grateful. YM: You’ve been travelling all over the place lately, care to share? Any fun stories over your career? JD: I think so far, the most memorable trip I’ve had is definitely going to Italy with Cycle World Magazine. It was a once in a lifetime opportunity to visit the largest motorcycle show in Europe and I”ll never forget it. A vacation to Milan to visit EICMA and spend a few days at the show is definitely on my list. I highly recommend going at least once! It’s like Disneyland for Motorcycle lovers. YM: Tell us a little about your current projects and plans (Moterrific, Philadelphia, GearChic, etc.) and how to keep up with you. JD: Moterrific is the only all female hosted motorcycle podcast (that I’ve seen so far) and my cohost Cristi Farrell and I record shows remotely. I plan on continuing this show when I go to Philly, all while working full time at Revzilla. You’ll also still be able to find me at GearChic.com, where I’ll be sharing the product reviews that I’ll be able to put together at Revzilla. You can visit me in person at the beautiful Revzilla Boutique in South Philadelphia! YM: You meet a woman who tells you she’d love to start riding, but she isn’t really too sure of herself or what to do, you have thirty seconds to give her advice… Go! JD: Whatever you do, take a training course and educate yourself on what you need to learn to ride. Don’t let ANYONE make these decisions for you. Riding a motorcycle is a choice driven activity. You’re the only one who gets to make decisions about how you ride while you’re on the bike, you should also be the only person who get to off the bike as well. What bike you ride and the way in which you learn will greatly impact your self confidence and overall success. It’s all up to you and no one else to ride! 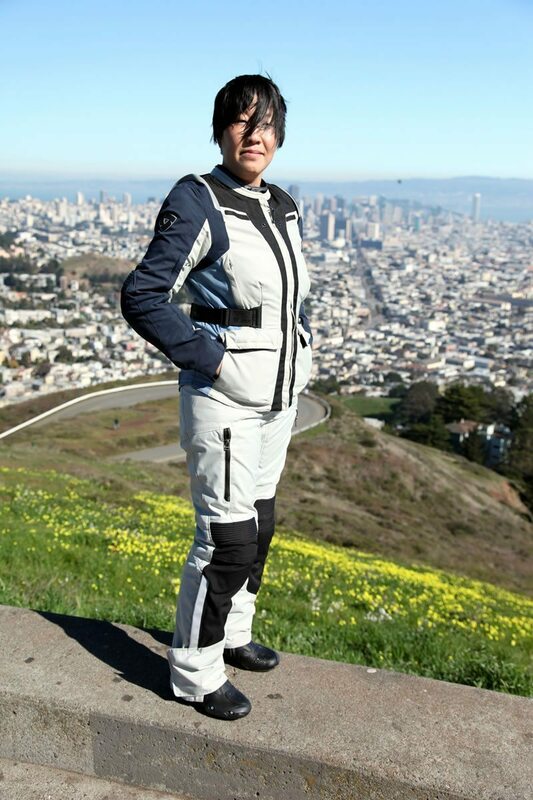 Thank you Joanne for all of your work in the two wheel community, both in person and online. I’m convinced you’ve helped more motorcyclists than you’ll ever know. 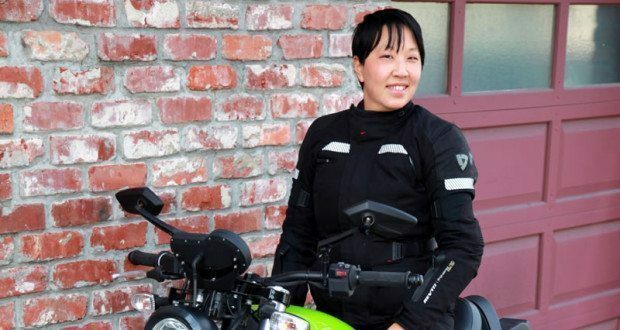 Keep it up and congratulations on being YouMotorcycle’s Woman of the Month!